Upscale food trucks are THE in thing these days and you know what? I’m very ok with that. What could possibly be better than freshly made, mobile and low-cost food? As a Philadelphia resident, I’ve been eating at food trucks for years. Luckily, we live in a city lush with carts, a city that beat the recent trend with its line of specialty trucks along Spruce Street on Penn’s campus. Trucks like Le Anh and Magic Carpet have been there since I can remember. In fact, there are so many, I recently (like, just now) learned that there is a website devoted to Penn food trucks–PennFoodTrucks.com. How cool is that?! Philadelphia, along with many other big cities across the country, has fallen hard for food trucks. Recent, hip additions to the scene include Tyson Bees, La Copine Brunch Truck, Sweetbox Philly and, of course, Iron Chef Jose Garces’ Guapos Tacos. Many of these trucks have twitter accounts so their hungry followers can locate them with the click of a keyboard. Somehow, the mobile nature of these trucks makes it all part of the game. 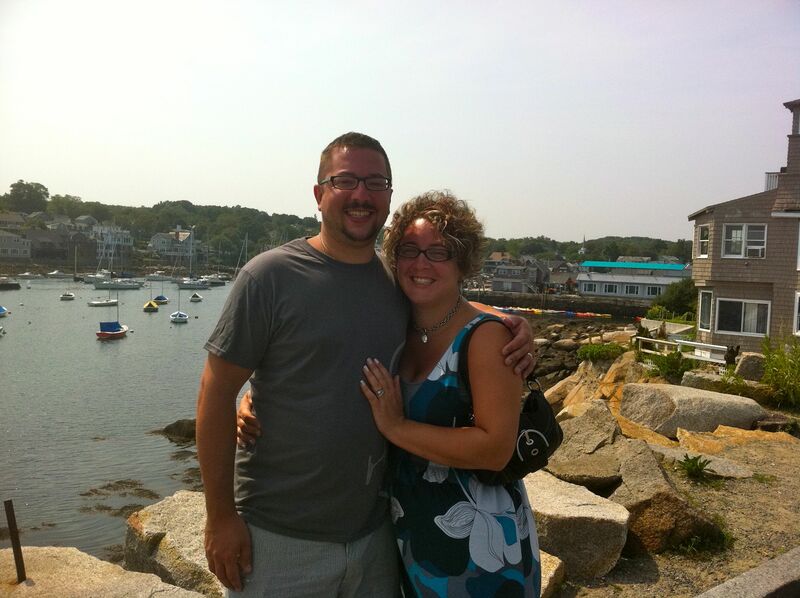 My husband and I travel to Gloucester, Massachusetts a few times a year to visit family. Gloucester is a sleepy little Portugese and Italian fisherman’s town that is best known for the movie The Perfect Storm, Gorton’s Fisherman and this guy. While The Perfect Storm is a fairytale that falls far outside the understanding of most Northeasterners, the story hits a little too close to home for many fishermen’s families in the area. Each June, the city shuts down for the Festival of St. Peter, the patron saint of fishermen. For the visitors to Gloucester and other coastal New England towns, lobster is a delicacy. To these fishermen and their families, it is their livelihood. Because I love to support the local economy, we do our very best to eat lots of lobster when we’re in the area. From rolls to benedict to boils, we don’t discriminate. In fact, it’s not uncommon for us to eat a lobster roll for lunch followed by a lobster dinner that night. At prices lower than a half-decent steak, how can you NOT eat lobster? My fabulous sister-in-law, who recently moved to Gloucester with her husband, had some news that she just couldn’t wait to share. “Guess what?! 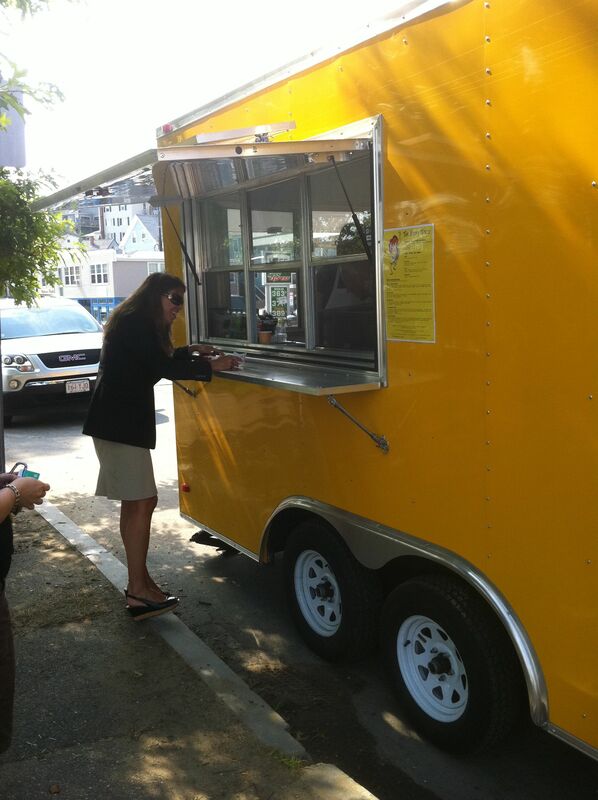 There’s a FOOD TRUCK in Gloucester!! 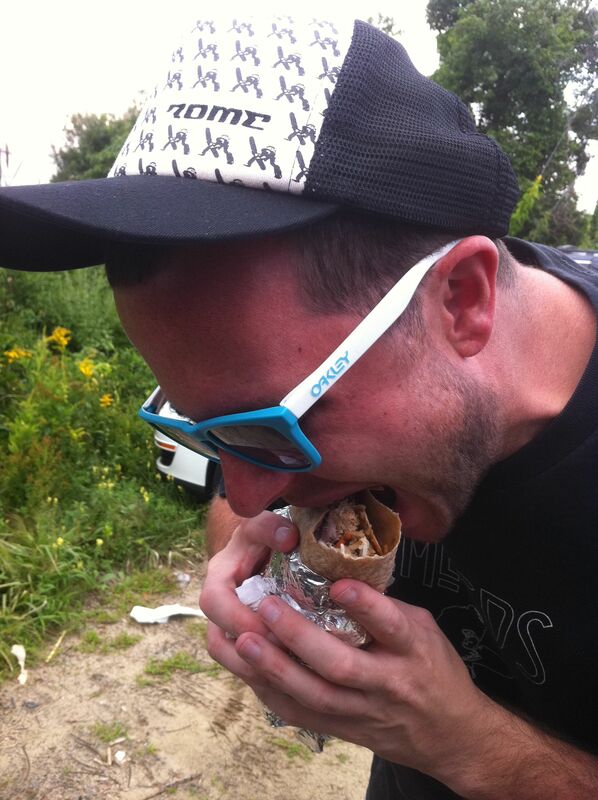 !” I was shocked to learn that a taco truck had recently popped up in town. I just had to try The Happy Taco. After a fun day of shopping at an hour way too close for dinner, we decided to take the plunge. 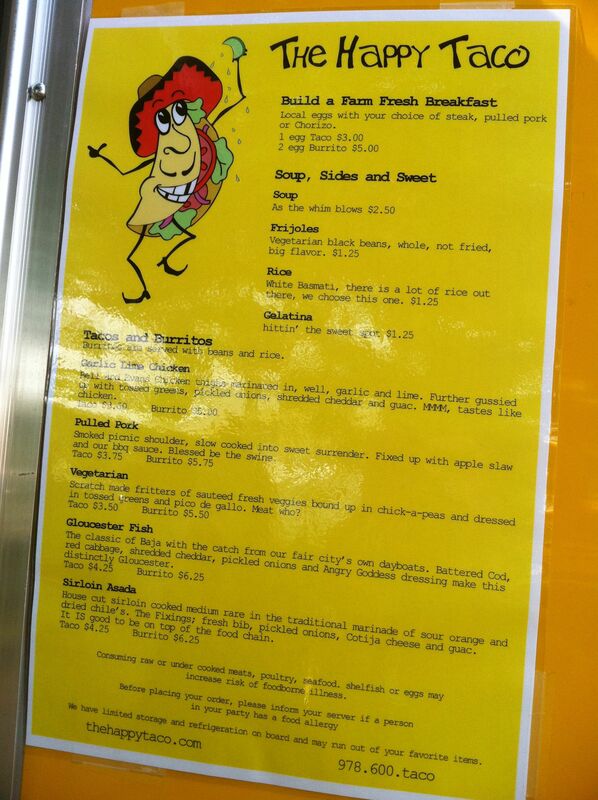 I love the friendly yellow truck with a literally “Happy Taco” logo. We called my husband and cousin because we didn’t want them to miss out on the fun and ended up with two sirloin asada, one fish (recommended by the owners) and one pulled pork burrito. The owners were beyond friendly and accommodating. They were even nice to the woman behind us who thought she was at a Taco Bell. 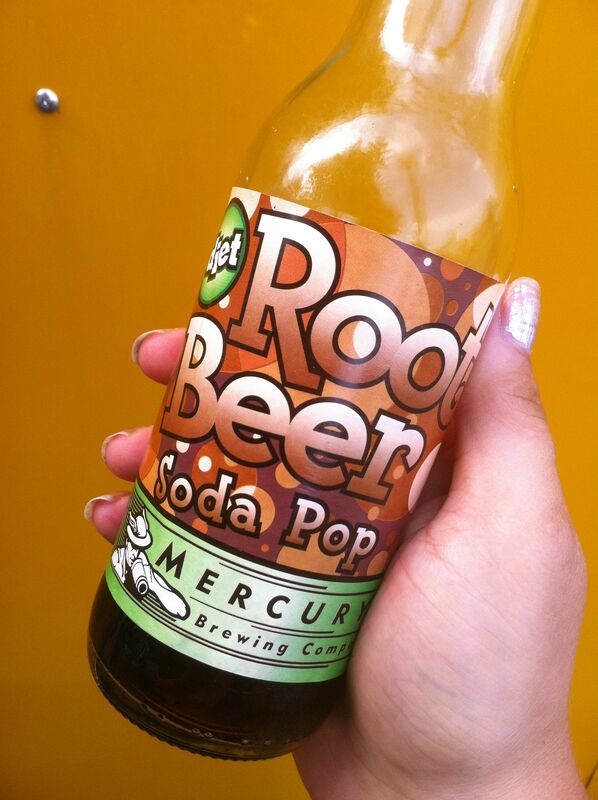 We also grabbed a couple local Mercury sodas made by the nearby Ipswich Ale Brewery. 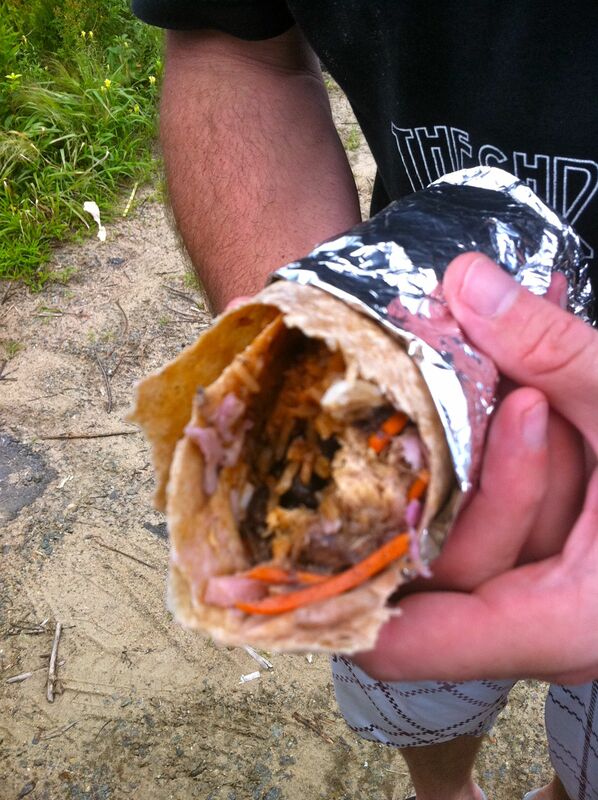 After a slightly too long wait–I’m hoping they’re just working out the kinks–our burritos were ready to go. Unfortunately, we had to resist digging into them until we met up with the guys but the smells permeated the car. Drool. When we finally tore into them, they were worth the wait. The sirloin asada (my order) was great. Tons of flavor and lot of crunchy lettuce. It was a touch heavy on the rice, though. 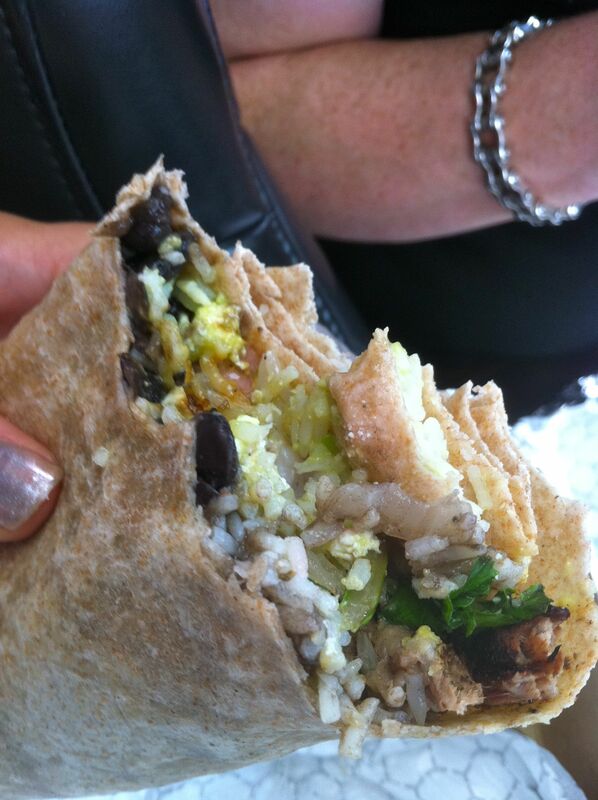 It’s difficult to find the perfect balance in a burrito. To me, it’s about having a variety of flavors but also textures and a wet: dry ingredients ratio. As promised, the fish was excellent. 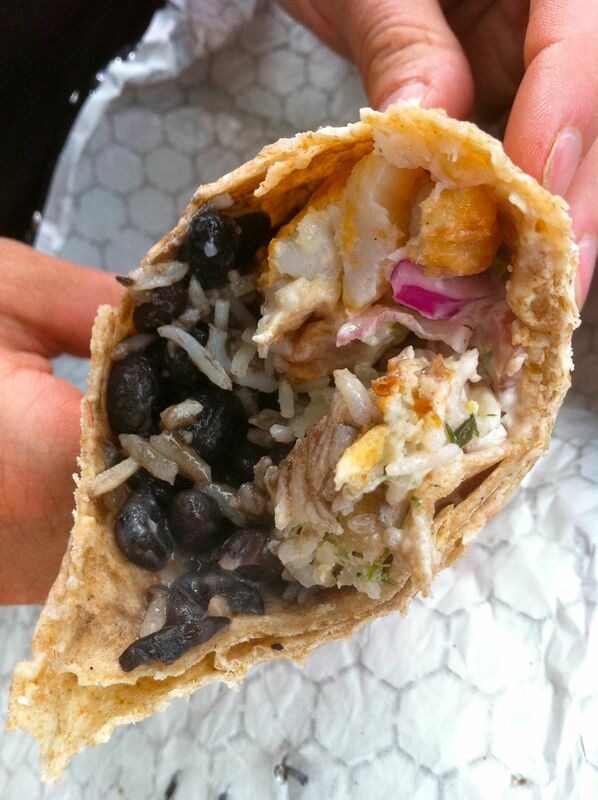 The battered cod played its role perfectly in creating that perfect balance in the burrito. Check out that flaky fish! The pulled pork definitely wins for the most flavor-packed dish of the day. Besides, this guy likes it. The Happy Taco is a great addition to Gloucester’s waterfront. The affordable prices create accessibility for a variety of customers and the fresh and nutritious food will keep them coming back. With a little tinkering here and there, The Happy Taco has the potential to be a serious contender–not just for the fishermen but on a national level. How can you possibly visit Gl’ster so frequently without checking in with us up here in Portsmouth once in a while? Great food here too, at Street (a bar with food styled after worldwide street food! – great Banh Mynhs, pho, for example in a town without a Vietnamese restaurant to call its own), Lobster places on the water with BYOB and BYOS (S=sides), Wellington Room, other locavorian places…we have a spare room on the top floor and you can walk from our place downtown and back! We actually wanted to go up there last time but the timing didn’t work out. We’ll definitely be checking it out sometime soon and I’ll let you know. Street sounds fun!